It's been hardly five months since the OnePlus 6T broke covers in late October and hit stores in November and now, OnePlus is reportedly planning to bring the company's next big flagship phone new OnePlus 7. We'll be getting some official details about an upcoming OnePlus device - likely the OnePlus 7 - on Wednesday, April 15, according to a tweet straight from the company's founder and CEO Pete Lau. This year, however, the Chinese company could take a different turn by launching a "Pro" variant of OnePlus 7 along with it. Along with the launch date the leaks also reveals the tagline for upcoming smartphone which is "Go Beyond Speed". The OnePlus 7 will again come with an in-display fingerprint scanner and will have an impressive screen-to-body ratio. If that info is to be believed, the OnePlus 7 Pro will sport extremely thin bezels, its "chin" will be slightly thicker than the rest of its bezels, while a pop-up camera will be a part of the design. There are many rumours surrounding the OnePlus 7, and all the fancy new features it's alleged to have. The Pro variant is also expected to come with curved display. 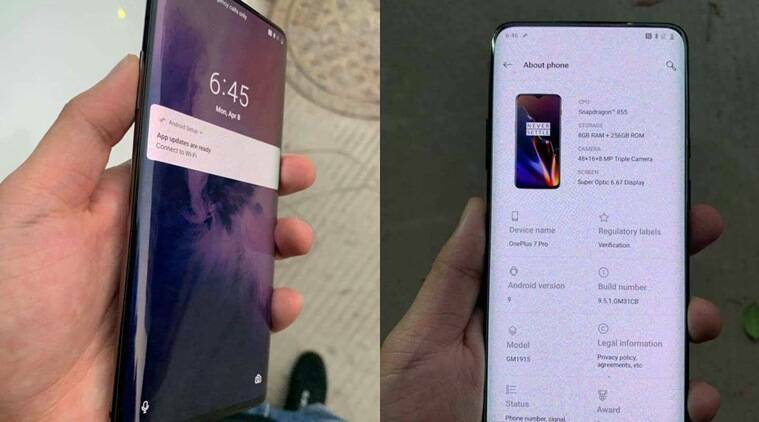 As per the leaks, OnePlus 7 will have a complete edge-to-edge display panel, inspired by the Vivo V15 Pro and Oppo F11 Pro. As far as the rear cameras are concerned, OnePlus 7 is expected to get a triple camera setup with a 48-MP primary shooter having a Sony IMX586 sensor.